PMP (Project Management Professional) is one of the most widely recognized and highly sought after certifications in the world administered by Project Management Institute, PMI USA. Here are reasons / benefits of PMP Certification. Most people look for ways to take the next steps in their career and up their experience and earning potential. One of the best option is becoming PMP certified. Resume is your first contact with the employer which represents you even before you have a chance to impress recruiter in person. Putting PMP Certification in your resume undoubtedly set you apart from your rivals and lends credibility to your experience, skill set, knowledge base, and level of seriousness about your career. PMP Certification signifies that you have attained knowledge of globally recognized best practices. Even if you don’t want to pursue a career elsewhere, your current employer will recognize your certification as evidence of your commitment to your work. Certified PMPs enjoy significant advantage in terms of salary and earning over counterparts. According to the PMI Global Survey (2015), PMP Certified individuals garner more salary (20% higher on average) than uncertified practitioners. Companies value PMP certification, and all that it implies, and are willing to pay more for that value. Even if you have less experience in the area of field or a fresh graduate, PMP certification will place you at the level of experienced ones. Companies across many different sectors seek talented, qualified professionals to make sure their projects are executed with excellence. Project management is a rapidly growing need, and the need has been outpacing the supply in the past few years. Today more than ever, companies and businesses are looking to certified project managers to help bring organization and skill to their various endeavors. Even in Pakistan, number of multinational organizations are looking for talent who have technical knowledge (engineers) while having the ability of managing projects by their own. Because the demand for project managers is high in a variety of industries, it will be important to give yourself a competitive edge over others, and the best jobs will be reserved for those who have the training, experience, and knowledge that comes with PMP certification. Networking is an important part of getting ahead in career, and having instant connection to others in your field is an enormous benefit. PMP Certification and PMI’s membership will give you an opportunity to network with other professionals within Pakistan and across the globe, and help you extract best out of it. Knowledge & skills gained through PMP certification can be transferred across any industry and geography when it comes to their practical application. The PMP credential is not restricted to any single methodology, standard or organization. It is also widely accepted across industries, including manufacturing, construction, Information Technology, aerospace and defense, utilities, telecommunications, banking and finance. In order to be successful as a project manager, there is a lengthy list of terms that you must understand and be able to articulate to others. While you may learn the language of project management with on-the-job training, you are going to master these many terms by successfully completing the PMP certification exam. Taking a course to prepare for PMP certification will help to ensure that you aren’t just taking the terms in and spitting them back out on paper for the sake of passing, but are really internalizing the concepts and understanding all of the terms you will be using on a daily basis as a project manager. If you love managing projects, making sure everyone and everything is working to the best of their ability, then you will want to continue to be challenged in your career. Project management is a rewarding career, but is most rewarding when you’ve embraced and overcome new challenges. With PMP certification comes the potential for greater responsibility and deeper challenges. If you’ve begun to feel like the projects you’re managing are losing their excitement, getting your certification can open new doors to opportunities that will require effort and commitment to excellence in new and rewarding ways. Job security has been more fragile after the economic recession of 2008 and professional across the world are worried regarding their job positions and livelihood. Technology has already taken 90% of the human jobs (Forbs), and people are losing their jobs every day to artificial intelligence and technological advancement. Project managers, though, continue to be in high demand. 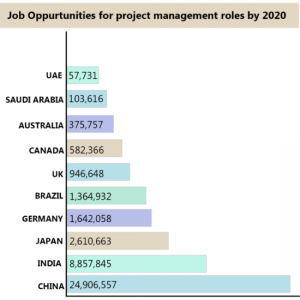 According to PMI’s Job Growth and Talent Gap Report, “Across the globe, there’s a widening gap between employers’ need for skilled project management workers and the availability of professionals to fill those roles.” This trend has continued steadily since 2008, when PMI first set out to gather data on project management demand.